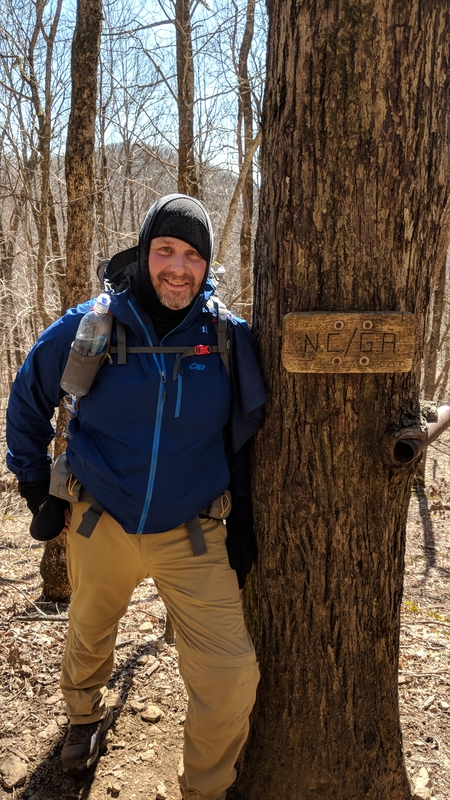 After two days spent at the Top of Georgia Hostel due to weather, I decided to take the advice of much younger hikers and slack pack from Unicoi to Dicks Creek. It’s easy they said; no problem at all. So off I went. To start with it was raining, then after an hour of that it started snowing, then add some sleet, and finally hail and rime ice, all with arctic wind blasts. The only thing left was frogs and locusts. Somewhere around the halfway point I met Lionheart, who had hot chocolate, Oatmeal Creme Pies, fruit, and an entire box of new handkerchiefs. So after a nice cup of hot cocoa and a new rag, off I went. Next stop Kelly’s Knob. Personally, I think this guy Kelly is a knob. But I finished it none the less. By the time I came down my feet and knees were in pain. And I still had more miles to go to reach Dicks Creek Gap. Since I was slack packing I had no shelter to set up camp for the night so on I trudged, hating my knees and feet. I still had to make the gap by 6 p.m. for the last shuttle. Unfortunately, I did not make it, so with feet that really didn’t want to take another step I walked the .7 miles back to the hostel. Once there I gladly took the longest hot shower I could take. And went to bed completely spent. Being a new hiker at 47 with bad knees, it was a lesson learned the hard way not to take the advice of twentysomething hikers with fresher legs than mine. Tried to play it smart and just did a little under five miles to Plum Orchard Shelter since I had burned myself out the day before. 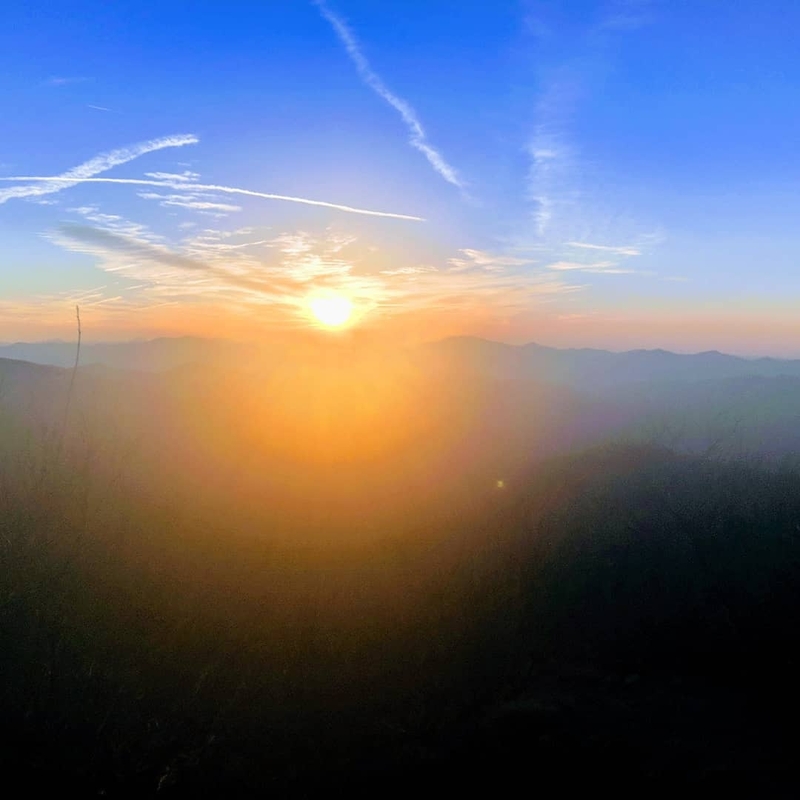 The next day took me 12.3 miles to Carter Gap Shelter, which was the only option other than a tent site. Again my knees and feet told me this was to soon for that mileage. But I knew the next day I was going to have to do it all again because I had only one day worth of food left. I left before daylight so I could hike at a slower pace to Winding Stair Gap and make the shuttle to Franklin. It’s a good thing I actually was able to make it with a half hour to spare. Along the way I grabbed breakfast of two tortillas and peanut butter, and enjoyed a beautiful sunrise. And along the way two other very important things happened. Now for a St. Paddy’s day in Franklin, new Hoka shoes, and a resupply of food. Monday I will be back on the trail starting again at Winding Stair Gap. And going forward. I’m 56 and am planning on a April sendoff. Don’t know how far I’ll make it but got to try! May go till really warm up north, then bus up and hike back. I’m in it for the rejoice in all that God has made!!! I am starting the trail in June with much younger also non hikers. We will see how it goes. I follow you with great interest. I hope I do as well. I am 76 so we will see. I hope you make your journey. I know you will. I always wanted to do this but at the age of 62, some medical issues, I am hiking with you thru this page. Keep on trekking. Enjoy the views. Maybe after you get through with your journey you can write a book and I will read it. God bless you.